When we (Scott & Breanna) first met Christine and Tom, we knew immediately that they were the kind of people we wanted to work with. We hit it off instantly and had a great time hearing about their wedding plans, as well as sharing in their excitement for the big day. Lucky for us, they felt the connection as well and asked us to be their wedding photographers! 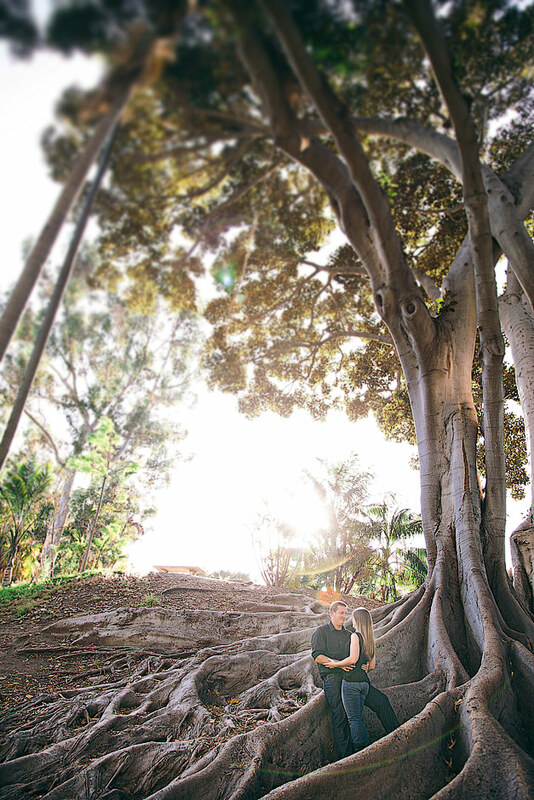 When it came time for their engagement photo session, we were again reminded of how happy we were to be working with them! 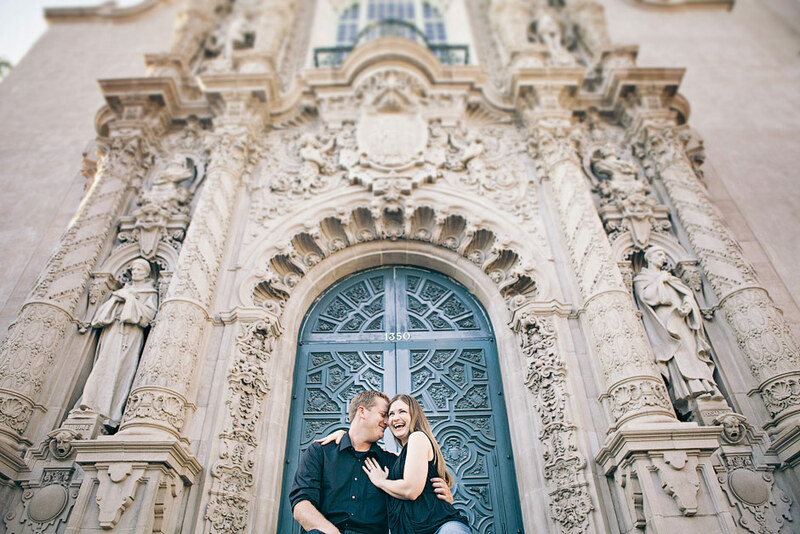 We hung out in a cool Shakespearean pub before we started the session, and by the time we headed over to Balboa Park and pulled our cameras out, we felt like old friends! Which is excellent because like we always say, most people are uncomfortable in front of a camera, so if they’re at least comfortable with the people holding the cameras, they will be able to relax and be themselves more… and that shows up in the photos! So Christine and Tom, I’m hoping you were as comfortable and chill with us as you seemed, and that you like the photos all the more for it! We can’t wait to spend more time hanging out with you on one of the most important days of your lives! See you then! 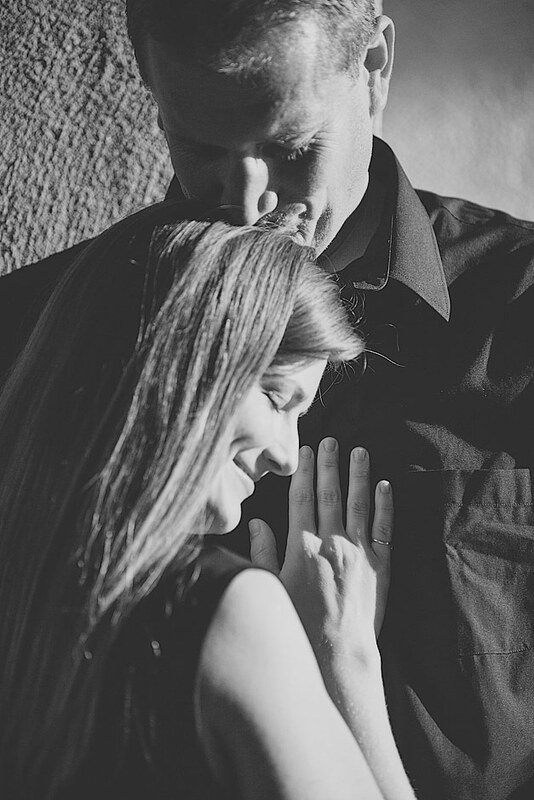 Click to see the rest of the photos from Christine and Tom’s chill engagement session! We all know it’s those little moments in life that make up the whole. So of course a wedding day is no different. Every wedding that we (Scott and Breanna) attend has it’s own special blend of moments, and it’s our job to capture them not as separate pieces, but in a way that molds them together to form the larger story they tell. Like our other weddings, Lisa and Ted’s was a series of beautiful and memorable moments, all linked together to create their story. But unlike other weddings, the moments that made up Lisa and Ted’s story were wonderfully and uniquely them. If I had to choose, I’d say that my favorite of their many moments were the emotionally expressive ones. Good thing too, because there were a lot of those! Their reveal moment alone contained more of those beautiful emotional moments than I could include in this single post! (Click here to find out some of the reasons Lisa and Ted chose to see one another before the ceremony!). Of course their ceremony itself had it’s fair share of amazing moments as well! And not to be left out, the reception held it’s own in the emotional moments department! As is true in any good story, there were many different kinds of wonderful moments on that day, and there were equally as many different types of emotions to suit the various moments! Everything from serious and tearful, to joyful and celebratory were present and accounted for that day. As in any Radiant Photography wedding (especially those held at Condor’s Nest Ranch! ), there were also moments of picture time that demanded to be shown off to you as a part of Lisa and Ted’s story… and as a part of our own story! 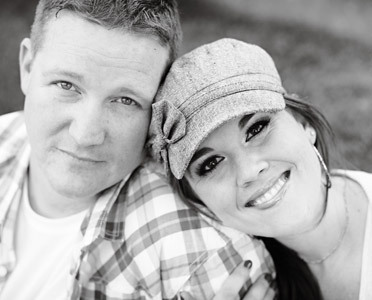 Lisa and Ted, thank you so much for allowing us to be a part of your story. Not only was it an incredible one that anyone would’ve been happy to be involved in, but it was also a very special one to the two of you, which makes it all the more meaningful that you chose us to be a part of it and trusted us to capture it for you. Congratulations on being a new Mr. and Mrs.! Click to see the rest of Lisa and Ted’s Wedding Photos here. I’m not sure what Chloe’s final graduating GPA will be, but I do know for a fact that she’s smart. How do I know? Because she decided that having her senior photos taken on the beach in 70 degree weather was better than getting them done in her hometown in Arizona where it was 115 degrees! It actually was a fantastic idea! Chloe grew up vising San Clemente with her family each summer, so what better place to capture the memories as she moves on towards leaving her childhood behind? The location also worked out well for us (Scottie & Breanna) since we did senior sessions for Chloe’s brothers when we lived in Arizona and now that we’ve moved out to California, we couldn’t have been happier to have her follow us out here for her session! As you can see, my suspicions about Chloe’s high intelligence being reflected in her location choice, are correct. Because we got some AMAZING shots that only a Southern California beach can give you! Along with those shots, came some great memories of times along the San Clemente pier captured! Not to mention the one especially amazing memory of the trip out there that stands out above the rest because it was the time she had her senior photos taken! Chloe, we hope you enjoy every second as you finish out your high school experience and head off towards new adventures! We are so happy you chose to do your session in California and that we got to be a part of it! Good luck on all you do in the future… especially on those volleyball skillz! We look forward to seeing all the places you’ll be heading off to! Click to see the rest of the photos from Chloe’s Beachy senior session. Mel - Chloe!!!! These are awesome! What a great idea! Obviously, Nat and I LOVE LOVE LOVE the action shot of you attacking that ball!!! These pics show that you are so beautiful, inside and out! Right now, you may be thinking to yourself, “Josh and Kelley, what are you thinking? August is a weird time for a senior session… Didn’t school just start?” And, if we were discussing a Phoenix senior, you would be right. If she lived in Phoenix, this girl would be busy running around buying school supplies, finishing up the summer reading that she had put off for almost three months, and trying to figure out her new class schedule. This little lady does not, however, live in Phoenix. Nope, she lives in my (Kelley’s) beautiful home state of Washington. More than that, she lives in what used to be my home. Radiant readers, followers, and fans, meet my sweetest and littlest sister Brianna. Schools in Washington don’t start back up until September, so Brianna still has a few more glorious weeks of summer. Lucky for me and Josh, she decided to spend one of those weeks with us here in Phoenix. While she was here we had game nights, ate way too much junk food, poked fun at Josh for being a meat-eater who was officially outnumbered by vegetarians in his own home, researched college and scholarship applications, and hung out and shopped with our other sister and her kiddos (aka our super adorable nieces and nephew). In the midst of all that, we decided it would be a perfect time for us to take Brianna’s senior photos. She had been talking to Josh and me about this for a while, and we thought it might be fun for her to trade in her normal pine tree backdrop for some palm trees, making her photos a little “different” and that much more special. I’ve got to tell you, taking these photos was a little mind-blowing for me. I swear that I was JUST getting excited about her first day of kindergarten and asking her to pose with her Powerpuff Girls backpack. Yes Brianna, yes I DID just put that picture up on the Internet for the world to see. You can thank me later. Powerpuff Girls aside, I love the snot out of this little sister of mine, and she’s definitely somebody that I’m proud to call family. Best of luck on your senior year Brianna! Josh and I are super proud of you and we know you’ll do great! Click to see the rest of Brianna Phoenix Senior Session here. When Breanna and I started Radiant Photography all of those years ago I knew it was such an honor to be a part of the beginning of peoples lives together. What I didn’t know was what a blessing it would be to watch the marriages grow into families. This is never more apparent to me than when one of our past wedding couples call us to do a family photo session. A few weekends ago we got to do just that with Erin and Alex who’s wedding is one of the very first that we photographed as Radiant Photography. Their wedding day was so much fun, here is their wedding blog to prove it …and the fun continues with the addition of their beautiful daughter, Kami!!! One of my favorite parts of editing sessions like this is to see all of the different expressions we can get out of these kids and Kami did not disappoint! Thank you Erin and Alex for allowing us to be a part of your lives and your family’s story. Click to see the rest of Erin, Alex, and Kami’s photos here!